Adult Themes: There are violent incidents throughout the book, but they are not overly graphic. Plot: Maggie Stiefvater uses inspiration from a Celtic myth about water horses—beautiful, deadly fairy creatures that are part horse and part man-eating sea monster—to weave this gripping tale. Men on the island of Thisby have been catching and trying to tame the water horses for generations when the creatures emerge onshore in fall. The tradition has spawned the yearly Scorpio Races, an extraordinarily dangerous event in which riders jockey mostly wild water horses in hopes of winning a fabulous cash prize – if they’re not eaten by their own, or an opponent’s, mount in the process. The book opens with a scene in which young Sean Kendrick watches his father meet an untimely end during a race, then flashes forward: Sean Kendrick is now nineteen years old and the most renowned trainer of racing water horses on the island. Everyone knows he’s a sure bet to win this year’s race. But teenage Kate Connolly, otherwise known as Puck, has her eyes on the prize, too. She and her brothers were orphaned when their parents were eaten by water horses, and now her oldest brother plans to leave for the mainland. Puck must win the race to earn enough money to support herself and her younger brother, but she can’t afford to buy a water horse and so begins training her small pony to compete alongside the savage animals. Stiefvater winds the plot so taut as the book leads up to the race that it’s impossible to turn the pages fast enough. Our Take: The language in The Scorpio Races is easy to read (the average fifth grader could handle it without difficulty), but themes are sometimes dark, making this book more appropriate for middle schoolers. It would be an excellent choice for a high school student who struggles a bit with reading. Because chapters are narrated alternately by Sean and Puck, both girls and boys will find the book appealing. Although life on Thisby is harsh and dealing with the water horses and other competitors is inherently violent, humorous moments sparkle throughout the book, particularly when the impish Puck takes over the storytelling; she’s one of the most delightful characters we’ve come across in a long time. 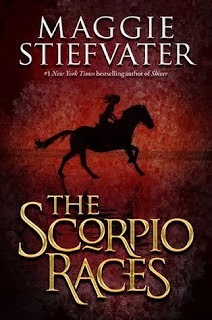 Though the myth of water horses is obviously the stuff of fantasy, Stiefvater’s style is otherwise realistic, so the book will appeal to lovers of fantasy as well as readers who steer clear of fairy tales and magic. Good to Know: Warner Brothers is currently working on a film adaptation of the book. Unfortunately, readers who love this nail-biting book will have to endure yet more suspense: it is set to be released in 2015.